Day three of the Salkantay trek and with a slight hangover from the celebrations of the night before 7 am was an early start. As with every evening Saul our guide would talk us through what we could expect from the next day. Day three was Saul’s favourite – walking through the jungle along the river, stopping at some fruit farms to try fruit and avocados. Our moods dampened by the news of our less than impressive route and the rain, we walked along much slower than previous days. As we turned the corner and see the avalanche over the other side which had wiped the path, we were all great full for our guide and his sense of safety. To access the fruit farm on the other side we had to climb down the side of the valley to a bridge made of what looked like straw and bamboo. I’m yet to cross a bridge in South America and be convinced its completely safe. This was no different. So one by one we gingerly walk across and up the other side to the farm, where we try the local grown produce of passion fruit and meet a playful puppy that had a knack for undoing shoe laces. After thirty minutes we were ready to continue our 16km walk to lunch. This time we carried on the same side and followed the path deeper into the jungle, thankful for the drizzle and the clouds that kept the suns heat at bay. The path meandered along the rivers edge, and at times dived deeper into the jungle, crossing waterfalls and rocks that glistened like gold and silver. Apparently a chemical reaction with the rock and water. Dotted along the route are little wooden shacks and places to rest where you can eat gigantic avocados in bread and drink fresh coffee for 5sol/ £1:50. After five hours and 16 km of walking, we made it to the rondeavouz with our minibus to take us to lunch. Thats if this junk of metal would actually make it there. It had more holes and patch up jobs, than Trumps first year in office. But just like so many Americans we had to put our faith in this old rust bucket and it’s driver. Thankfully it got us to lunch and to our campsite for the evening in Santa Teresa. The best bit about the afternoon on day three, is spending a few hours in the thermal springs and a shower for the first time in three days. The Termales de Cocalmayo are positioned right next to the river Urubamba and consists of 4 large pools, the largest at the bottom being the coldest. The smallest at the top had water so hot, it was like stepping into a newly run bath. Two and half hours of absolute bliss. The only issue were the mosquitos waiting to bite you alive once you stepped out of the water for more than thirty seconds. That evening was pitched as the party night, where we would dance around a fire and drink lots and lots of booze. Pisco, rum and wine in no particular order. One would fall off a wall injuring his leg and another would fall face down, narrowly missing the smouldering ash of the fire. Hangovers a plenty the next day, it was time for zip lining – a first for me and I was super excited providing I could keep down my breakfast. 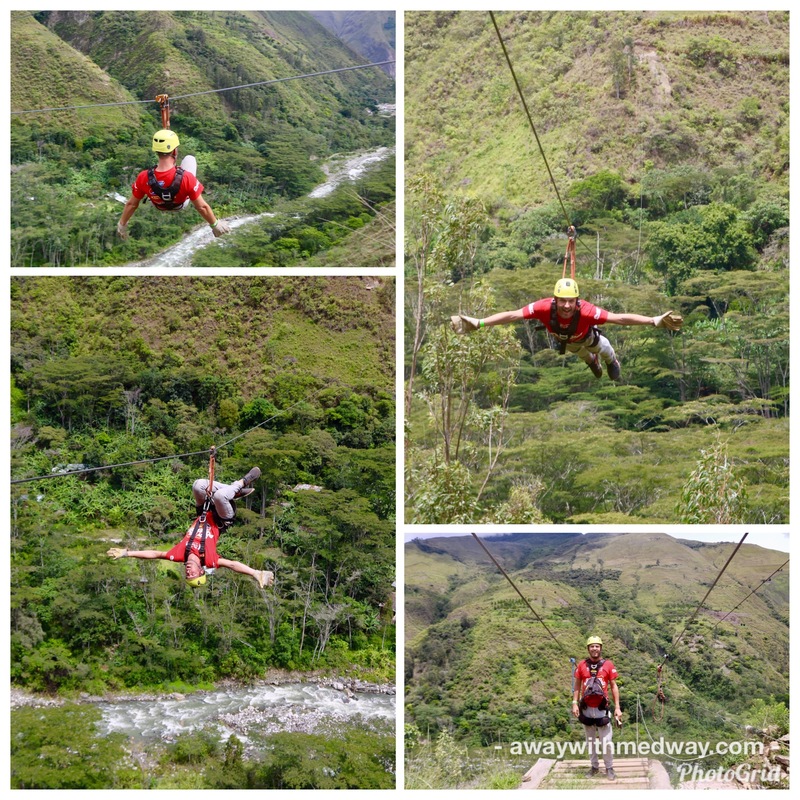 3km of lines high above the canopy of trees and an aggressively flowing river. The second zip was the best. The first to go, I was positioned upside down, looking up at the bright blue sky while the river and trees wizzed passed my head. On the third you get to try out your superman skills. If only I had my cape with me. The fun was shortly over and it was time to join the remainder of the group and drive to Hydroelectric for lunch. Lunch was in a restaurant that clearly just caters for the the majority of the treks that go to Machu Picchu, the restaurant was rammed. Some of the other gringos had been bitten alive by mosquitoes and sand flies, with legs that looked like bright pink sponges. They were that bad, you could be mistaken for thinking they had chickenpox. Plenty of strong mosquito spray with deet is certainly required on these treks or just cover up your legs. Luckily they don’t like me or bite me, so I felt a bit smug walking around in my shorts. The only issue I had was having to rely on a good amount of Imodium for the last three days. It would seem any food would need to go in and come straight back out again. Trying not to be to graphic here, but you get the gist. 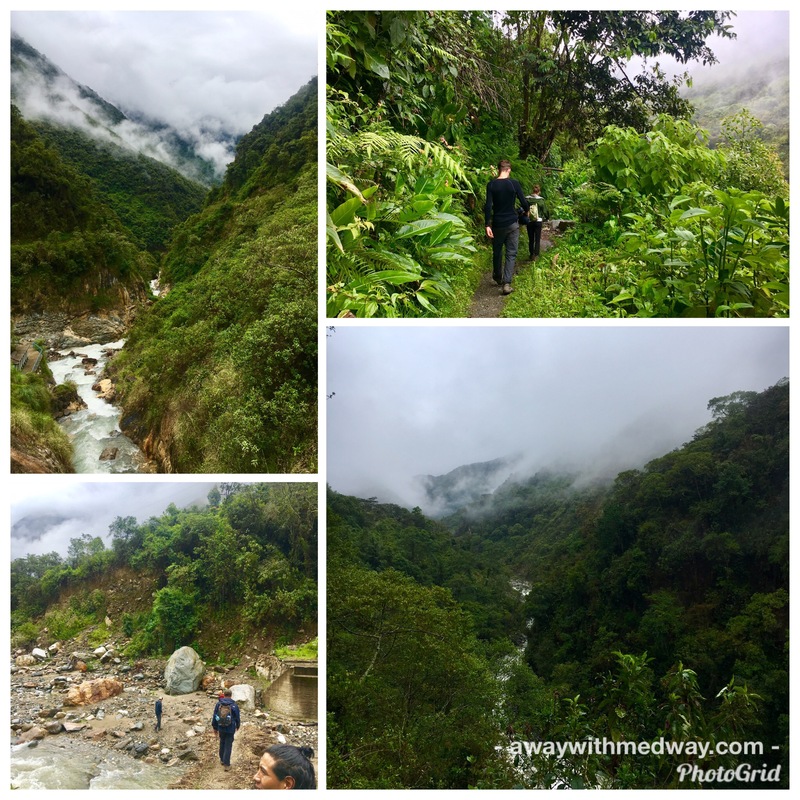 The next two hours and 8km of walking is along the train tracks to Aguas Calientes, where we spend our final night of the trek. 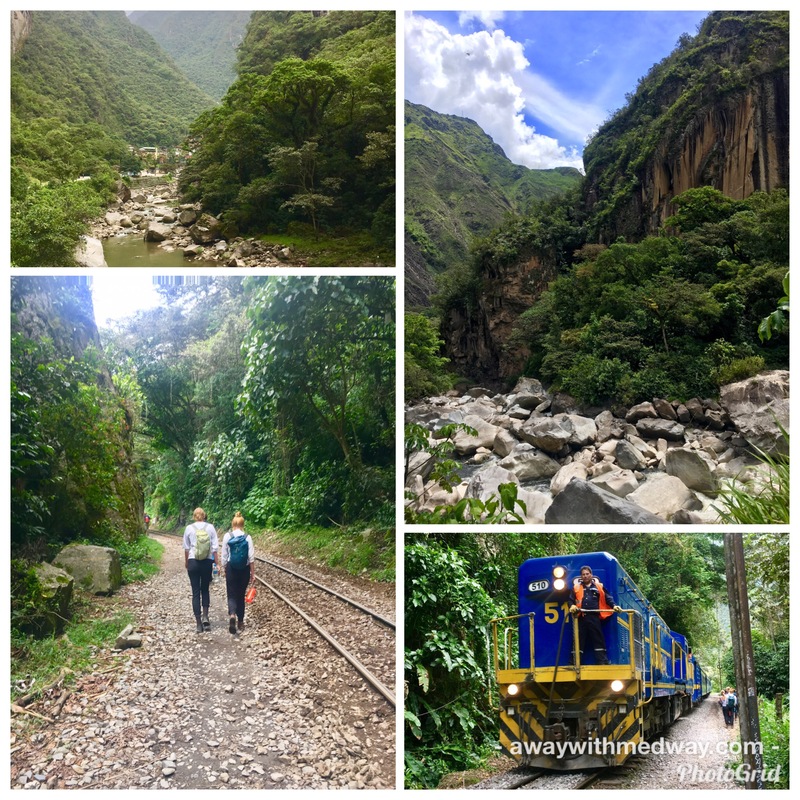 The tracks follow the river and wind around the base of Machu Picchu mountain, and every so often you here the horn of the train. Thinking it would be a good idea to walk through the bridge instead of along the footpath. We hear the distant horn of the train and had to leg it across the 300m bridge. Pretty scary as we wouldn’t have survived the 50m drop to the river. Arriving in Aguas Calientes we were all pretty shattered. Tonight we get to stay in a hostel and eat in a restaurant. We pray for pizza, but sadly it just more of the same, we just get to choose what meat. Wake up is at 4:15am as we have to be at the front gates of National Park for 5am when it opens. Still pitch black we walk the thirty minutes and join the queue that has already formed. I somehow lost my entry ticket, which we were given the night before. So I had to run back with the guide to print a new one. Thankfully I realised in time. What a plonker. The gates open, and we cross the bridge and make our way to the start of the 3000 steps and make the climb to reach the entrance of Machu Picchu. After four days and 60km of walking this was bloody tough. Thank god we still had the morning fresh air to keep us cool. Doing it in the heat of the day would be pure hell. After Forty five minutes, which seemed like hours I reached the top. Some of the group couldn’t face the steps so they paid extra for the bus. I say take the steps as its part of the whole magical experience. With the group reunited it was finally time to see what we had all been waiting for and the whole reason we walked 64km over five days. The magnificent wonder that is Machu Picchu. Climbing more steps we reach the first viewing platform which gives you a full view of the Machu Picchu mountain and the remains of the Inca city. Which I learnt still to this day no one knows the name of. The next two hours are spent walking around with Saul while he tells us the fascinating history, and what each building once was and how important this city was and how it was never finished. There is the option to walk up to the sun gate, the original entrance and only access to the city for all visitors and goods. 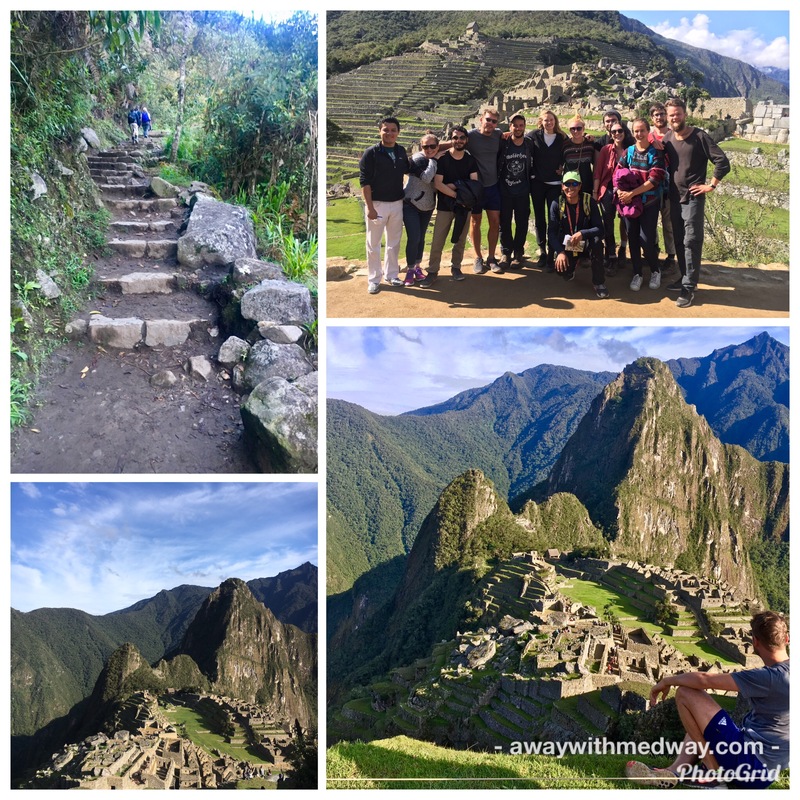 If after five days of trekking you still have the energy, you can walk up to the top of Machu Picchu mountain for $80 or the less gruelling Huayna Picchu opposite. I managed the thirty minutes walk up to the sun gate and was surprised how high it was. The city looked tiny from up here. We seemed to be higher than Machu Picchu mountain itself. After four hours of exploring, sadly it was time to leave this incredible sanctuary and make the two hour walk back along the tracks to Hydroelectric, have some lunch and meet the bus. For what I can only describe as the most torturous seven hour bus journey back to Cusco. If I had known how cramped and uncomfortable it was going to be I would have paid the extra $65 and got the train for four hours and the bus for two more. The cost varies depending on the time of the train. 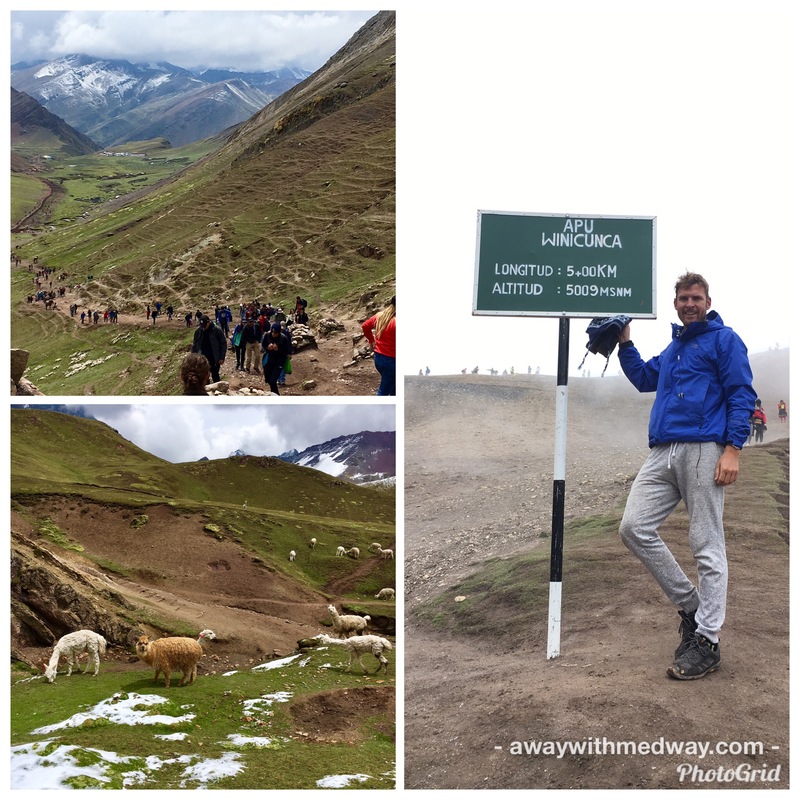 Back in Cusco and back with Keno and Esteban we recount our experience over a curry and plan to book Rainbow mountain for two days time. I certainly needed the two days to recover before I hike to 5000m. 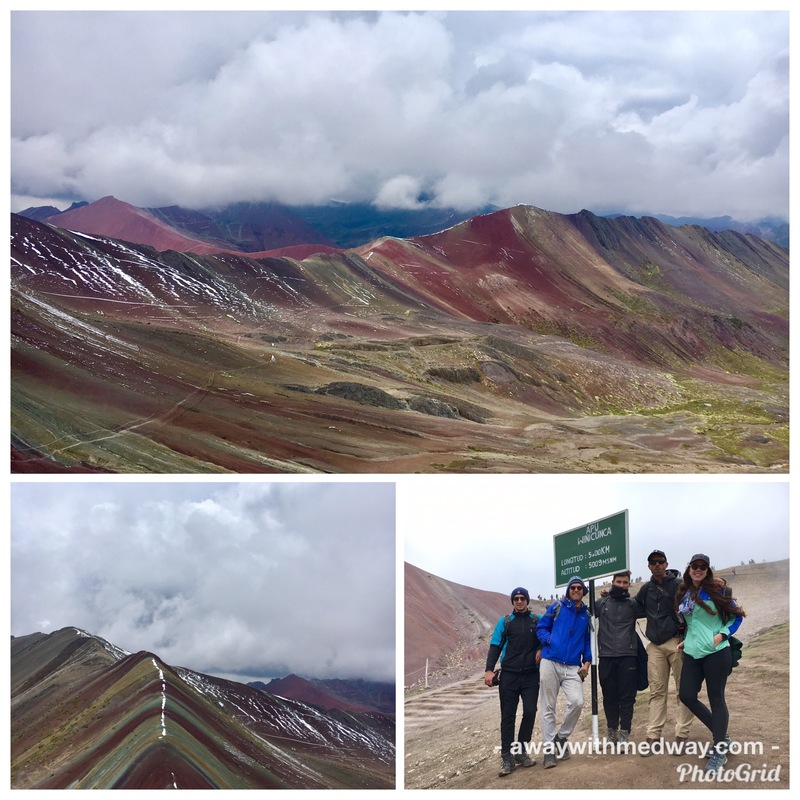 The Rainbow Mountain is a good two to three hour bus ride away and involves getting up at 3:30am. Loaded onto the minibus full of local Peruvian’s we make our way to the first stop at Checacupe for breakfast. From there it’s another forty minutes winding drive up to Quesiuno at 4326m. It’s then that I realise coming on a Sunday was a bad idea, there are hundreds of busses and good 1000 or so of people being heard up like sheep. Those that couldn’t manage the walk up could make use of the many horses available. Now I was getting use to this sort of height, I had no problem. The same couldn’t be said for Keno and Esteban who needed to take their time. Now I see why they opted for the Jungle “kids” Tour. At the top we were told we could only have 30 minutes before we would have to make our way down. They really need to limit the amount of daily tours, to make the experience more enjoyable. Sadly it had snowed that morning and the sky was grey with clouds, so the effect of the Rainbow wasn’t as impressive as I have seen on some Instagram pictures. Back down again first to the bus I managed to get few winks of sleep before everyone else arrived. One woman needed oxygen and wasn’t well, while another one had an argument with me about seating. I wasn’t in the mood for this today. Something you learn quickly about South Americans is how precious they are about the seat on the bus. Best way is play dumb and pretend you don’t understand and don’t speak Spanish. No way was I moving this time.